Clinical presentations may differ in neonates vs. older children or adults. Infants usually manifest signs of rising ammonia concentrations with poor feeding and somnolence. Older children and adults often initially present with irritability, headaches (reflecting increasing intracranial pressure) and vomiting, with progressive alteration in consciousness. On infants, hypoglycemia can initially present with irritability, restlessness, poor feeding and progress to seizures and coma. In older children and adults initial symptoms include hunger, shaking or trembling, sweating, weakness, anxiety and lightheadedness and progress to confusion, somulence, seizures and coma. Confirm initial diagnosis with stat blood ammonia and comprehensive metabolic profile to determine liver function. If patient has a known metabolic disorder discuss patient’s status with treating metabolic center. Most centers have 24/7 coverage for emergency consultations. If patient has suspected or possible inborn error of metabolism obtain critical blood and urinary studies (see Diagnosis), obtain information from family history about other known or suspected cases and begin emergency management protocols. Confirm diagnosis with finger stick glucometer reading. If a metabolic or an endocrinologic cause is suspected, especially in children, before beginning IV dextrose administration consider obtaining blood samples for insulin, comprehensive metabolic profile, CPK, amino acids, acylcarnitine, and total and free carnitine level. Obtain first urine void for routine urinalysis to check for presence of ketones. Begin oral or IV replacement of glucose to re-establish normoglycemia. Are there clinical or radiographic signs of increased intracranial pressure? Is there clinical or laboratory evidence of dehydration? If so may need bolus saline. Begin medical and nutritional therapies to minimize catabolism usually with 10% DW /1/2 normal saline at 1.5 x daily maintenance. If patient has a known inborn error in the urea cycle or another organic acidemia (e.g. propionic or methylmalonic acidemias) and can tolerate oral or nasogastric therapies, begin ammonia “scavengers” or “detoxicants” to reduce ammonia accumulation. Most widely used product is BUPHENYL® [sodium phenyl butyrate] tablets. If patient is unable to tolerate oral or N/G administration, begin IV administration of AMMONUL® [sodium phenylacetate and sodium benzoate]. This product must be given through a central line and it is critical to carefully follow instructions for the loading and maintenance doses. These pharmaceuticals are usually only stocked in pharmacies in centers that regularly treat patients with inborn errors of metabolism. Acute hyperammonemia should be managed in an intensive care unit that is experienced in the medical and nutritional monitoring and treatment of inborn errors of metabolism. Hemodialysis is most effective to rapidly lower body stores of accumulated ammonia and often used in conjunction with the above products. Acute and chronic treatment of increased intracranial pressure is often necessary. Obtain history of current and any past events. Begin glucose replacement. In mild hypoglycemia with patient alert and able to take orally can give 10-20 grams of carbohydrate in 3-4 oz. of fruit juice or non-diet soda. Can also give table sugar or honey in water. Oral glucose gels and tablets are available for individuals with repeated episodes. Repeat finger stick glucose readings every 5-10 minutes until no longer hypoglycemic. If patient unresponsive or unable to swallow, begin IV glucose infusions. General guidelines are: (a) infants: minibolus of 2ml/kg of 10%dextrose water and continue at a rate to provide 6-8 mg/kg/min; (b) older children: can be administered bolus of 25% dextrose water; and (c) adults: 50% dextrose water. Given the hyperosmolarity of the 25% and 50% dextrose water solutions, they must be given only into a patent vein to avoid marked tissue necrosis. Once glucose levels are stable, based on clinical status and laboratory studies, determine if patient needs hospitalization for further evaluation and management. Rapid initiation of therapy is critical to prevent acute and long-term brain damage from hyperammonemia. Initiate basic therapies to prevent catabolism and increased intracranial pressures in the emergency department. Once acute management has begun, transfer patient to a center experienced in the medical and nutritional management of inborn errors of metabolism. Rapid correction of blood glucose concentrations is paramount to prevent acute and long-term brain damage from hypoglycemia. Before discharge from the emergency department or hospital, stabilization of blood glucose, nutritional counseling and home monitoring of blood glucose and ketones must be satisfactory. Hypoglycemia, like anemia, is a laboratory value, not a final diagnosis. Especially in infants and children, it may reflect a serious underlying metabolic or endocrinologic disorder that needs to be identified for long-term management. Hyperammonemia results from one of several inborn errors in the urea cycle and in other inborn errors of metabolism such as the organic acidemias. The initial or presumptive diagnosis rests upon an abnormal plasma amino acid profile and abnormal intermediate metabolites of the urea cycle being found in the urine organics. There can also be elevated concentrations of urinary orotic acid. The final diagnosis is confirmed by molecular analysis of the suspected abnormal gene(s). Whole blood ammonia (stat). Be prepared to repeat blood ammonia if the concentration is mildly to moderately elevated and the specimen was not properly and quickly collected and analyzed by the laboratory. Comprehensive metabolic profiles to include glucose, electrolytes and liver function profile (stat). Coagulation studies if bleeding or generalized hepatic dysfunction is suspected. Blood lactic acid levels and blood or urine ketones to assess acidosis and ketosis. Quantitative plasma amino acids (stat or within 24 hours of initial presentation). Urinary organic acid analysis and quantitative urinary orotic acid concentrations (stat or within 24 hours of presentation). Plasma acylcarnitine profile (stat or within 24 hours of initial presentation). Plasma total and free carnitine concentrations (stat or within 24 hours of initial presentation). Confirmatory biochemical and/or molecular tests: For a worldwide list and for direct access to web sites of all commercial and academic referral laboratories that test for inborn errors of metabolism, see the GeneTests web site at: http://www.ncbi.nlm.nih.gov/sites/GeneTests/?db=GeneTests. Multiple algorithms and flow charts have been prepared to investigate suspected metabolic and endocrinological causes of hypoglycemia. Most consider the age of onset of hypoglycemia; known precipitating factors such as diet, specific foods or exercise; and physical findings such as the presence or absence of hepatomegaly and presence or absence of ketosis, lactic acidemia, hyperurecemia, etc. 1. Clinical presentation in 1st month. 2. Clinical onset after 1st month or diagnosis based on family history. 3. Clinically significant difference between groups for cognitive and adaptive outcome. Simultaneous Insulin and glucose levels, cortisol and growth hormone levels. Comprehensive metabolic profile, CPK, lactic and uric acid levels. Amino acids, acylcarnitine, total and free carnitine level. First voided urine after the episode for routine urinalysis to check for presence of ketones. The results of these studies should be reviewed with a metabolic geneticist and/or endocrinologist to determine if additional diagnostic studies are indicated. Normal blood ammonia concentration is between 10-40 umol/liter; however, there are differences related to the age and general health of the patient and different units may be reported from different laboratories. Many factors influence the accuracy of blood ammonia concentrations, including tourniquet use, GI bleeds, recent transfusions, protein intake, smoking, etc. Critical to accurate measurement is proper specimen handling, including collection in the proper tube, immediate cooling of the sample, and rapid transport to and analysis in the chemistry laboratory. Usually defined as less than 45-50 mg/dL in adults and less than 40mg/dL in infants and children. How do I know this is what the patient has? Unless the patient with hyperammonemia presents with a known inborn error of metabolism, the final diagnosis may not be established for hours or days. Regardless, the initial emergency department and intensive care unit focus should be on reducing as quickly as possible the blood and central nervous system ammonia concentrations, preventing further production of ammonia by body catabolism by providing adequate energy using no or low protein calories, but high carbohydrate and fat calories, and by treatment of increased intracranial pressure. Hypoglycemia is a laboratory value and not a final diagnosis. If an etiology for the hypoglycemia is not found during the initial presentation, a referral should be made to a metabolic/endocrinologic specialist for further evaluation and management to prevent further episodes. In addition to inborn errors of the urea cycle and other inborn errors of metabolism, there are many other causes of hyperammonemia. Most obvious are hepatic failure from toxins, bacterial and viral infections and many acute and end stage liver diseases. Occult gastrointestinal bleeds can elevate blood ammonia concentrations. In most inborn errors of urea cycle metabolism, the blood ammonia is in the moderate to markedly elevated range, whereas other causes of hyperammonemia usually lead to mild to moderate elevations, although exceptions occur. There are multiple metabolic causes of hypoglycemia. During the neonatal period galactosemia, tyrosinemia, fructose intolerance, amino acidopathies such as maple syrup urine disease, and organic acidemia, and one of multiple inborn errors of fatty acid oxidation such as medium chain acyl-CoA dehydrogenase deficiency, are possible. The standard filter paper card newborn metabolic screening test detects many, but not all, of these disorders. A normal newborn metabolic screen does not exclude the possibility that an infant has a metabolic disorder. The older infant and child with hepatomegaly may have a glycogen storage disorder or an inborn error in carbohydrate glycosylated proteins. Children with disorders in mitochondrial oxidative phosphorylation can have recurrent hypoglycemia. There are specific genetic over or undergrowth syndromes associated with hypoglycemia such as Beckwith syndrome (overgrowth) or Russell-Silver syndrome (undergrowth). Finally there are multiple endocrinologic causes of hypoglycemia, including: hypopituitarism, hypoadrenalism, hyper-insulinism, etc. Finally despite an extensive evaluation, some patients never get a formal diagnosis, but are still managed with frequent feeds, monitoring their blood glucose status and rapid, multiple trips to the Emergency Department. Quantitative plasma amino acids (stat or within 24 hrs of initial presentation). Urinary organic acid analysis and quantitative urinary orotic acid concentrations (stat or within 24 hrs of presentation). Plasma total and free carnitine concentrations (stat or within 24 hrs. of initial presentation). 1. Simultaneous insulin and glucose levels, cortisol and growth hormone levels. 2. Comprehensive metabolic profile,CPK, lactic acid and uric acid levels. 3. Amino acids, acylcarnitine, total and free carnitine level. 4. First voided urine after the episode for routine urinalysis to check for presence of ketones. Begin medical and nutritional therapies to minimize catabolism usually with 10% Dextrose water in 1/2 normal saline at ~1.5 x daily maintenance. If patient has a known inborn error in the urea cycle or another organic acidemia [ex: propionic or methylmalonic acidemias] and he/she can tolerate oral or nasogastric therapies, begin ammonia “scavengers” or “detoxicants” to reduce ammonia accumulation. Most widely used is BUPHENYL® (sodium phenyl butyrate) tablets or powder. If patient is unable to tolerate oral or N/G administration, begin IV administration of AMMONUL® (sodium phenylacetate and sodium benzoate). This product must be given through a central line and it is critical to carefully follow instructions for loading and maintenance doses. These pharmaceuticals are usually only stocked in pharmacies in centers that regularly treat patients with these inborn errors of metabolism. If blood arginine level is low, arginine hydrochloride is added to the IV. After the blood glucose has stabilized with intravenous dextrose, further management depends upon finding an underlying cause for the hypoglycemia. Endocrinologic causes will generally be treated with hormonal replacement therapies such as cortisol and growth hormone replacement for adrenal and pituitary insufficiencies. Management for metabolic disorders is usually nutritional and medical. For example if a glycogen storage disease is confirmed, depending on the type, frequent feeds every 2-3 hours may be needed along with nocturnal continuous nasogastric or gastrostomy tube feeding. Uncooked cornstarch mixed in milk can be effective in maintaining blood glucose levels up to 4-6 hours whereas glucose and snack bars may maintain blood glucose for only 1-2 hours. Diet may be adjusted to include more complex carbohydrates that help maintain normoglycemia. For inborn errors of fatty acid oxidation such as medium chain acyl-CoA-dehydrogenase (MCAD) deficiency, specialized diets are constructed to reduce fat intake and increase protein and carbohydrates to maintain adequate energy intake. Oral carnitine supplements and specific vitamins and/or other cofactors may be needed. Consultation with an experience metabolic nutritionist is imperative along with close monitoring of multiple metabolic and nutritional biomarkers. Critical to consult product information for the dosing, contraindications and side effects for all products. BUPHENYL® (sodium phenylbutyrate) tablets or powder: For oral administration. Depending on the disorder and degree of acute and chronic hyperammonemia give at 450 to 600 mg/kg/day in patients weighing less than 20 kg, or 9.9 to 13.0 g/m2/day in larger patients. Maximum established dose is 20 grams a day. AMMONUL® (sodium phenylacetate and sodium benzoate) injection 10%/10%: Dose depends on body weight and given after dilution with sterile dextrose. Give as a loading dose over 90-120 minutes and then repeated as a maintenance dose over 24 hours until patient can be weaned to oral medication and metabolic diet. Arginine HCL for IV use with AMMONUL: Range from 200 to 600 mg/kg/day. Must monitor blood arginine concentrations. Dextrose water: There are many concentrations of Dextrose water (5-50%) that are given in combination with various concentrations of saline to treat acute hypoglycemia. D10%W is generally used for newborns and infants and given at 2cc/kg. D25%W can be given to older children and D50%W is given to adults. The percentage of saline used depends on the degree of dehydration and the initial laboratory values. Both D25%W and D50%W are hyperosmolar and must be given through an open IV to avoid tissue infiltration and secondary tissue necrosis. Glucagon, a pancreatic hormone, is now made by recombinant DNA technology. It is traditionally used as a rescue for severe hypoglycemia from an insulin overdose. However, other than in glycogen storage diseases, it should be effective in most other metabolic causes of hypoglycemia as long as the patient has adequate stores of glycogen. Emergency kits with pre-measured doses are available. The usual adult dose is 1 mg and for children who weigh less than 20 kg (~44 lbs. ), the dose is 0.5 mg. It can be given subcutaneous or IM or more rapid onset. The effect is temporary and measures to continue normoglycemia must be instituted. Hemodialysis during acute severe hyperammonemia. Maintenance of normoglycemia by continuous enteral and/or parenteral nutrition. Consultations with a metabolic specialist, endocrinologist and metabolic nutritionist. In cases of confirmed urea cycle defects following treatment of acute hyperammonemia, the prognosis is guarded and depends on which enzyme deficiency is confirmed, the adequacy and compliance with the acute and chronic medical and nutritional management, co-existing medical factors, and the frequency and durations of recurrent episodes of acute hyperammonemia. Neonatal or infantile presentations usually indicate the most severe forms of the disorder with limited enzyme activity. Late childhood and adult onset indicate residual enzyme activity with improved prognosis. Neurological outcome depends on the frequency, duration and intensity of the hyperammonemic encephalopathy. Hepatic transplant has become more frequent in the severe neonatal and infantile onset forms. The immediate correction of acute hypoglycemia should be gratifying, with the patient rapidly regaining their previous neurological equilibrium. However recurrent and prolonged episodes of severe hypoglycemia can cause significant neurological damage. Long-term sequella depend on multiple co-existing factors such as the age of the patient, the severity and duration of the hypoglycemia, further anoxia from prolonged seizures and the underlying cause of the disorder. Recurrent prolonged episodes of hypoglycemia in infants and young children can lead to chronic seizures and intellectual disability. The effect of hypoglycemia on the fully developed brain may be less severe. The ability of the patient to generate ketone bodies which can be used as a secondary source of energy by the brain seems critical in reducing long-term disability. For instance, children with inborn errors of fatty acid metabolism cannot generate adequate ketones during hypoglycemia and they have severe intellectual impairment resulting from their hypoglycemia, whereas children with glycogen storage disease types I and III can have recurrent episodes of severe hypoglycemia but also generate large quantities of ketones that seemingly protects the brain from long-term damage. If an inborn error of metabolism is not established as the cause for the acute episode of hyperammonemia, other causes such as exposures to hepato-toxins, infections, or underlying non-metabolic liver disease must be excluded. It is unlikely that the diagnosis of hypoglycemia will be missed. It is more likely that an underlying cause for the low blood glucose will not be pursued or established and the patient sent home after the acute episode has resolved. Whenever a child or adult has recurrent episodes of significant hypoglycemia, all efforts must be pursued to identify an underlying endocrinologic or metabolic cause for the hypoglycemia. A careful medical, nutritional and family history can be invaluable to direct the clinician to a diagnosis. If an inborn error is not established as the cause for the acute episode of hyperammonemia, other causes such as exposures to hepatotoxins, infections or underlying non-metabolic liver disease must be excluded. Patients with recurrent hypoglycemia need evaluation by an experienced metabolic specialist and/or endocrinologist and by a metabolic nutritionist. If an inborn error of metabolism is suspected or confirmed, the follow up will most likely be at a metabolic center. If the hypoglycemic episode was prolonged, severe or accompanied by a seizure, infants and children will need neurologic and psycho-educational follow up. (Figure 1) While hyperammonemia can result from an overproduction of ammonia (NH4), it is more frequently caused by impaired conversion to urea. The impairment can be secondary to generalized hepatic dysfunction from acute or chronic liver disease or from deficient enzyme activity of one of several enzymes responsible for this conversion. Regardless of the etiology the most significant clinical manifestation is the encephalopathy from the increased concentration of ammonia within the central nervous system. As per GeneTest (http://www.ncbi.nlm.nih.gov/books/NBK1217/): “Ammonia can cause brain damage through a variety of proposed mechanisms, a major component of which is cerebral edema. 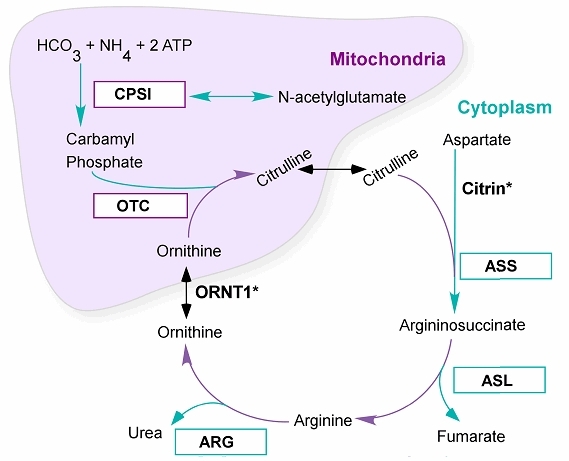 The specific roles of ammonia, glutamate and glutamine in cerebral edema are still under investigation but are thought to affect the aquaporin system and water and potassium homeostasis in the brain. Damage resulting from acute hyperammonemia in infancy resembles that seen in hypoxic-ischemic events or stroke. “Lacunar infarcts and white matter disruption are common findings. Chronic hyperammonemia may disrupt ion gradients and neurotransmitters, transport of metabolites, mitochondrial function and the ratio of alpha-ketoglutarate/glutamate/glutamine. Seizures are common in acute hyperammonemia and may result from cerebral damage. Recent findings suggest that subclinical seizures are common in acute hyperammonemic episodes and their effects on cerebral metabolism in an otherwise compromised state should be addressed. Note: Valproic acid should be avoided because of its effects on CPS1 function. Newer neuroimaging techniques that provide information about the timing, extent, reversibility, and possible mechanism of neural injury in a noninvasive manner can be used as an adjunct to predict clinical and neurocognitive outcome. Maintenance of normoglycemia is critical for optimal cellular energy production in all organs. The body has a complex, multi-faceted system of hormones, cell receptors and intermediate compounds of metabolism that can produce, store, release and utilize sufficient stores of glucose. The generation of ketones from fatty acid metabolism serves as a backup for cellular energy when glucose concentrations are inadequate. A breakdown at any stage in this complex system can lead to hypoglycemia. As blood glucose levels decline, pancreatic insulin secretion falls and pancreatic glucagon is released. In normal individuals, glucagon causes a prompt breakdown of hepatic stores of glycogen to glucose. Additional hormones such as adrenal epinephrine and cortisol, along with pituitary growth hormone, are essential in maintenance of normoglycemia. Many inborn errors of metabolism affect the production, storage or utilization of glucose. Individuals with classical galactosemia have an impaired ability to produce adequate glucose, especially during infancy. Individuals with glycogen storage disease, especially types I, III, VI and IX have impaired ability to break down their glycogen stores, which leads to limited ability to fast more than several hours. Other inborn errors of metabolism such as amino acidopathies may not directly affect glucose production or release, but secondarily prevent adequate build up of glycogen stores which during times of metabolic stress leads to secondary hypoglycemia. Finally, several inborn errors of fatty acid oxidation lead to impaired production of ketones that are essential to serve as a “secondary” or back-up fuel for the brain during times of inadequate glucose availability. Lacking the ability to store either glycogen or lipids that are need during times of hypoglycemia, the brain is especially vulnerable to inadequate supplies of glucose and ketones. The neurocognitive effects of hypoglycemia become readily apparent and have both immediate and long-term consequences. The epidemiology of all inborn errors of metabolism has previously been based on case recognition, most often for the classical or most severe forms of the disorder. As newborn metabolic screening becomes more prevalent for many metabolic disorders, better population estimates will be made, at least for the phenotypes that have abnormal metabolites as neonates. Milder forms will probably be missed on newborn metabolic screening. Most of the inborn errors of the urea cycle will NOT be detected by current newborn screening technologies. From GeneTests, the estimated minimal prevalence for urea cycle disorders is ~1 in 30,000 births (See GeneTests: http://www.ncbi.nlm.nih.gov/books/NBK1217/). Given the multiple causes of hypoglycemia a prevalence is difficult to determine. In terms of non-metabolic causes, hypoglycemia is very common in pre-term and small for gestational age infants secondary to their limited glycogen stores. Hypoglycemia secondary to excess insulin is common in insulin dependent diabetics. Many pharmaceutical and toxins induce hypoglycemia. In inborn errors of metabolism, without proper treatment and nutrition, hypoglycemia is frequent in individuals affected with galactosemia, hereditary fructose intolerance, several forms of glycogen storage disease, especially types I, III, VI and XI, organic acidemias such as maple syrup urine disease, propionic acidemia and methylmalonic acidemia, and in many of the inborn errors of fatty acid metabolism such as medium chain acyl-CoA dehydrogenase [MCAD] deficiency. Given the multiple metabolic disorders associated with hypoglycemia, it has been difficult to assess long-term outcome based solely on the hypoglycemia, since different disorders affect multiple other biochemical parameters. Anecdotal experience in most metabolic disorders finds poorer outcomes with recurrent bouts of severe hypoglycemia accompanied by metabolic acidosis, and in certain disorders with co-existing hyperammonemia, such as propionic acidemia and methylmalonic acidemia. A noticeable exception appears to be in children with glycogen storage disease Type I. Despite recurrent bouts of severe and chronic hypoglycemia, in this author’s experience, many children with GSD I have excellent, even superior intellectual outcomes. It has been postulated that the neurotoxic effect of hypoglycemia in these patients is ameliorated by their large production of ketones preserving brain function. Please emphasize how patients with acute hyperammonemia and encephalopathy can quickly deteriorate from a rapid increase in CNS pressure. When acutely ill, these patients need close ICU monitoring and a multi-team collaboration. Please emphasize that hypoglycemia is a symptom and not a diagnosis. In addition to managing the in-home and hospital blood glucose levels, an underlying cause needs to be found, especially in infants and children. Nutritional management is critical, with frequent feeds of complex carbohydrates and, if a metabolic disorder is found, then metabolic formula and foods. Home monitoring of blood glucose levels with letters for parents to give bring with them to an ED to assure that the child will receive rapid attention and glucose replacement. Three critical on-line sources should be consulted first for most inborn errors of metabolism.